Martin Grelle uses masterful brushstrokes to give the viewer a visual feast of color and all the historic details that are his trademark. 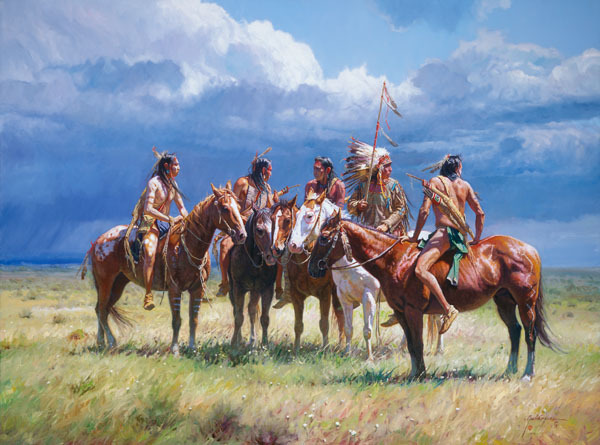 This image is the story of a chief and his braves waiting patiently astride their horses on the open plains. They know that "Waiting on the Wolves" will offer a good hunt for food and sustenance for their tribe.When horses were introduced to the Plains Indians, the new animals offered a means of transportation, a way to move their tribes and all their belongings, and an immense asset to their well-honed hunting skills.